Samuel Dearing, a wealthy dairy farmer, choose Augustus Gauger to design a grand home on the bluffs overlooking downtown Saint Paul. 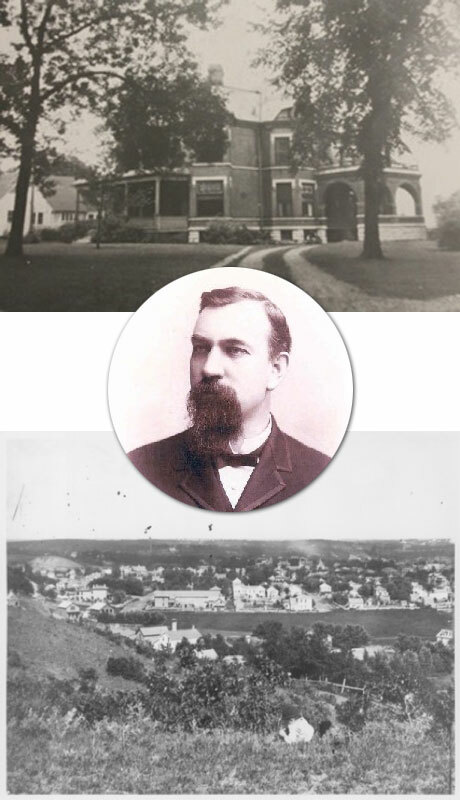 Gauger – who, as a young architect, designed the Bank of Farmington in 1879 – quickly became the architect to the St. Paul Board of Education and designed the Douglas, Franklin, Longfellow and Rice Schools. He also designed numerous stately homes in St. Paul, including a number of homes on Summit Avenue. Gauger’s reputation was national. He designed businesses, churches, courthouses, homes, and schools in California, Illinois, Iowa, Minnesota, Missouri, Montana, Nebraska, North and South Dakota, Oregon, Tennessee, Texas, Washington and Wisconsin. Augustus Gauger (pictured at left) died in February 1929 and is buried at Oakland Cemetery in St. Paul. He ranks as one of Minnesota’s great architects. The Dearing residence was built on the bluffs across the river from downtown and much of the land around the home was grazing pasture for Dearing’s prize dairy cattle. As economic times became tough, Dearing sold off much of the land around the estate as St. Paul grew. The Dearing family lived in the home until 1905, before moving to California. The home has gone through some rough times, and at one point was divided into four apartments, but after a multi-year restoration, the property has since been lovingly restored to its former glory.